Was Your Grandmother on to Something? Did you know that there is a non-profit organization devoted to line drying laundry? Project Laundry List promotes the environmental and economic benefits of allowing the sun and breeze to dry freshly washed clothes and linens. There are even clothesline enthusiasts who collect clothesline memorabilia and reflect on the nostalgia of the days when every home had an outdoor clothesline. The choices of clothesline styles have grown and some are quite stylish. You may even be able to install an outdoor drying rack that attaches to a flat surface and folds away to surprisingly like a plant trellis! If your neighborhood has banned outdoor clotheslines citing they are unsightly, you can still reap the benefits of line drying by using an indoor clothesline or indoor collapsible folding rack. Let's take a look at the top ten reasons to line dry laundry. The average household in the United States that chooses to abandon their automatic utility-powered tumble clothes dryer can save more than $200 per year on electric or natural gas or propane gas bills. A new clothesline is much less expensive to purchase and operate than a new clothes dryer. Line drying laundry conserves energy and helps to protect the environment by saving precious fossil fuels. It is the pinnacle of green laundry and living! There are more than 90 million clothes dryers in the United States, according to the Association of Home Appliance Manufacturers. Air-drying clothes can reduce the average household’s carbon footprint by a whopping 2,400 pounds a year. If all Americans line-dried for just half a year, it would save 3.3% of the country’s total residential output of carbon dioxide, experts say. Line dried clothes and sheets smell much fresher than clothes that are tumble dried without the use of additional chemical laundry fresheners like dryer sheets and fabric softener. This is particularly important for those sensitive to perfumes and dyes used in detergents and dryer products. And fresh air is less expensive than dryer sheets. Tossing and tumbling in a dryer can cause wear and strain on clothing fabric due to stress on seams and snags from buttons and zippers. Excessively high heat in the dryer can actually ruin some fabrics and cause irreversible damage. Line drying is more gentle to fibers. Hanging up laundry is a physical activity which you can do inside or outside. 15 minutes of hanging laundry or removing it from the line burns 68 calories. That's saving enough calories to enjoy a snack of 20 olives, two clementines or THREE mini Toblerone candies! The ultra-violet rays in sunlight helps to bleach and disinfect laundry. This is particularly beneficial to white sheets, towels and cloth diapers. However for dark colored clothes, excessive sunlight can cause some harm so keep them in the shade if possible to prevent fading. The colder temperatures and dry air of winter typically drops the humidity level inside homes. Lower humidity can contribute to dry nasal passages which welcome cold and flu viruses. Drying clothes on indoor racks can add humidity to a home's air during dry winter weather. Clothes dryer fires account for about 15,600 structure fires, 15 deaths and 400 injuries annually in the Untied States. The yearly costs in the United States for fire loss due to clothes dryer fires is estimated at $99 million. Using an indoor drying rack or outside line will help prevent dangerous fires. The average amount of time needed to hang a load of laundry is less than 10 minutes. But taking that time to enjoy the weather, the feel and smell of clean laundry can offer an outdoor experience that is meditative and helps reduce stress. 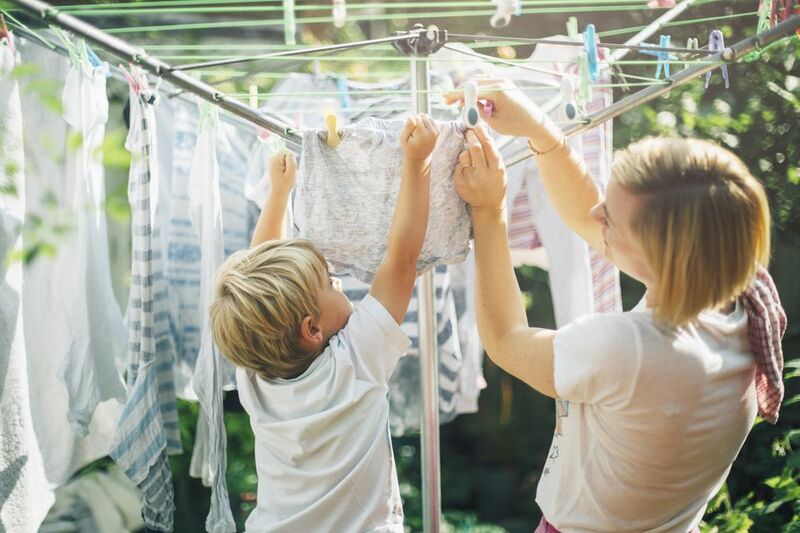 Line drying laundry demonstrates that you and your family are taking small steps to make a difference in your well-being. You don't have to wait for the government to take action to protect the environment or reduce your monthly expenses.